What can be done to eliminate this crack? I tried squeezing but that failed miserably. I'm asking because when it comes to wood repair i am an absolute idiot. Jim, if is a little hard to see exactly where that is [in the base], by the photo. I can see the crack, but can't tell where that piece of wood is , on the radio. It looks like wood filler would do the trick and then just sand it . BUT , I have found a better solution to wood filler. It is called Kwik wood ,made by JB weld. It comes in a container and you just cut off a section and knead it until it is all mixed. Then force it into the crack Let it dry , then sand it. It does not shrink, as most wood fillers do. and after the toner is applied you can't see where the filler is AT ALL. Thanks for that idea Dan. 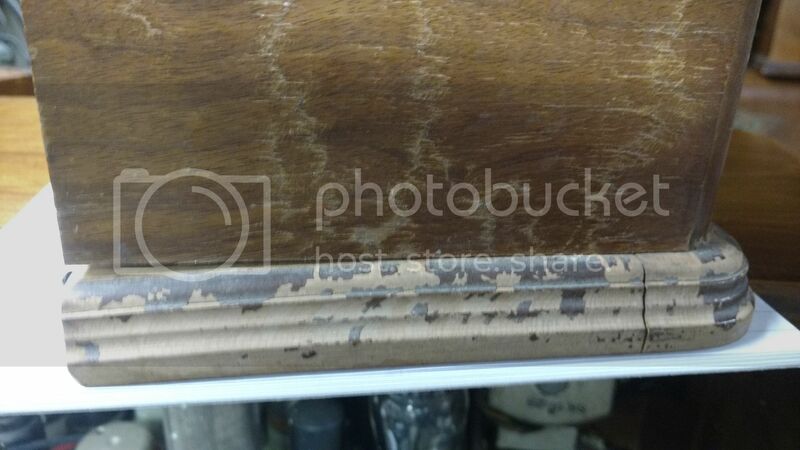 The crack is in the front left corner of the base for a Detrola 3302.
than the wood , so you have room to sand it down exactly even with the cabinet wood. Looks like the crack is the least of my problems. After regluing the top portion of the cabinet It doesn't fit evenly into the base. the back left corner of the base looks like its warped. Is there any easy way to unwarp it or do I need to build a new base for this? 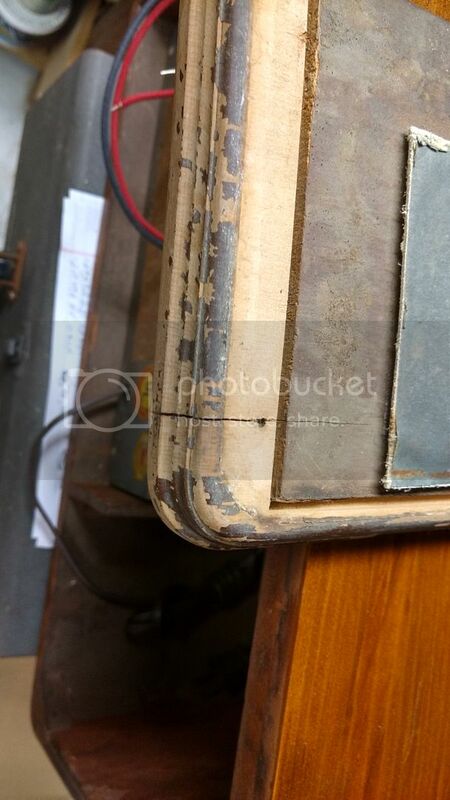 I have successfully repaired warped wood by dampening with water and weighting or clamping. Any cracks or loose wood must be repaired first. The wood needs to be wet to begin with, before attempting to straighten. Often shims will be needed to curve the warp to the other direction, but it is easy to over shoot. Oddly enough, once the warp is mostly out, wetting the convex side may cause it to flatten as it dries. Some people have said that the wood will eventually return to its warped shape. That may be true, but it has not been my experience, especially if it is secured to adjoining pieces. I agree with Mark . I have had good results with wetting the wood wet and clamping it. So how does one go about wetting the wood, soak it overnight? the cabinet so I just put it in the bathtub with warm water for about an hour. in order to get it wet. Is it attached to the cabinet at the moment? No, it has been removed from the rest of the cabinet. Did the JB Kwik wood and now I'm getting ready to soak the board. Question though, did you just let the board float in the bath or did you weight it down? I put the board in the water and weighed it down so the water will cover it. I have not used the qwik wood and then put it in water so let me know the results. I don't know how the water affects the kwik wood. How is this repair going? I, also, have never used J.B.Quikwood and am curious. Mark,, I have used it in several occasions and I really like it. BUT I have not put it in water, so that is why I am interested in knowing how it is after getting soaking wet. Haven' t done the soak yet. I still need something solid to place under and on top of the base once its been soaked and then something of substantial weight to place on top of the arrangement. Maybe this weekend. Finally have the base soaking with some floor tiles placed on top of it to keep it under the water and maybe help flatten it back out. I'lll,et it soak about an hour then take it out and leave the tiles on top of it for a few days until it dries out. The weight of the tiles may not be enough. 100 pounds of tiles seems like a lot, but a simple wood clamp can put 300 pounds of pressure on it. You can multiply that with more clamps. If you don't have a way of clamping it, you need more tile. I have 300 pounds of 18 inch tiles I use for straightening antique doors. You also risk wet parts, that you don't put pressure on, forming a new curve. It will take a few days to ensure it is dry. Trimming out 4 100 year old doors as 3 windows and 1 door today. 4 more to go. Best I could do with tiles is 100 pounds. Hope thats enough. On your original question, what you did was reasonable, so long as the case fits in the base. With a wider gap, anyone else with this problem should find a friend with a set of clamps and a plate/biscuit joiner. If the clamps have metal faces, protect the base with some pieces of pine or other soft wood. Force some glue into the crack, close it with clamps. Using the plate joiner, space out and cut 2 or 3 slots into the underside of the base along the crack, perpendicular to the crack. Number 10s are generally enough, but you can go smaller (0) or larger (20) depending on the size of the piece. fill the slots halfway with glue and slide the plates into the slots. Clean up the excess glue and let it set for 12 hours. Cut off the half of the plates sticking out from the base and sand them down flush. The crack will be stable until the piece rots. The moist glue expands the wood in the plate and the base and then dries while both are expanded. It is one of the strongest methods of joining wood. BTW, in my prior post, the panel surrounded by the untrimmed bookcases is 350 years older than the doors. The soaking and weights worked as the warp is gone. However, the crack has reopened which is no big deal. I'll just refill it and then I'll have to restain the base.